A wide selection of carefully designed fountain shapes, made of the highest quality materials and delivered pre-fabricated, pre-wired, ready for installation. 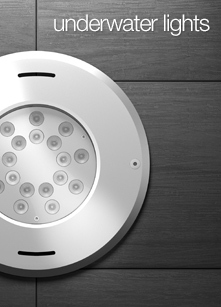 & Smart LED lights and Halogen lights for Fountains, Swimming Pools, Ponds & Gardens. Ideal for architectural or event illumination. 40 incredible water effects and dozens of accessories & pool fittings to choose from. & professional components like drains & suction strainers, made of Stainless Steel for exceptional performance, efficiency and corrosion resistance. 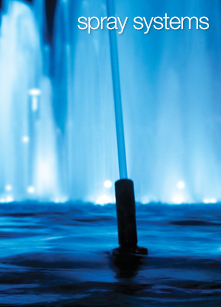 The intelligent devices that make a fountain work reliably & safely day-in, day-out. From fully automated Control Panels with Wind & Water Level automation to simpler, manual operation, to iPad controllable units. 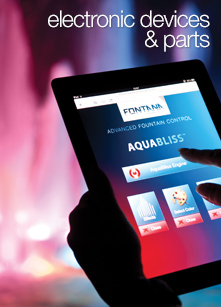 All Fontana standardised products can be customized according to customer requirements (e.g. 316 stainless steel, longer cable lengths, alternate mounting systems or spray patterns). If however, you are looking for a unique water effect, nozzle, luminaire or anything related to water, Fontana also creates custom products. 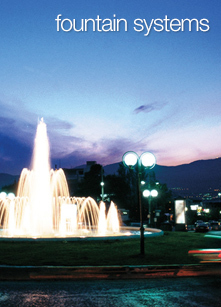 Since 1971 we have designed and manufactured extraordinary fountain equipment numerous times. With the aid of cutting-edge software and machines we can quickly develop a unique component, comprehensively test it in our facilities and manufacture it in very short times.